Going outdoors with Sealskinz in Freidrichshafen! It’s all about the OutDoor event at this time of year in Freidrichshafen, now in its 20th year this show has become one of the leading global trade fairs for the international outdoor industry. This trade only exhibition attracts buyers and exhibitors from all over the world. Camping, climbing, hiking and outdoor clothing companies launch a variety of new products at this spectacular alpine venue. Once again we are building the stand here for Sealskinz, the number one brand for waterproof and breathable socks, gloves and hats. Based in Kings Lynn, Sealskinz launched their Company in 1999 and have continued to grow to be one of the leading brands in the UK. The story of how it all started it incredibly interesting, take a look at the timeline on the Sealskinz website [here]. 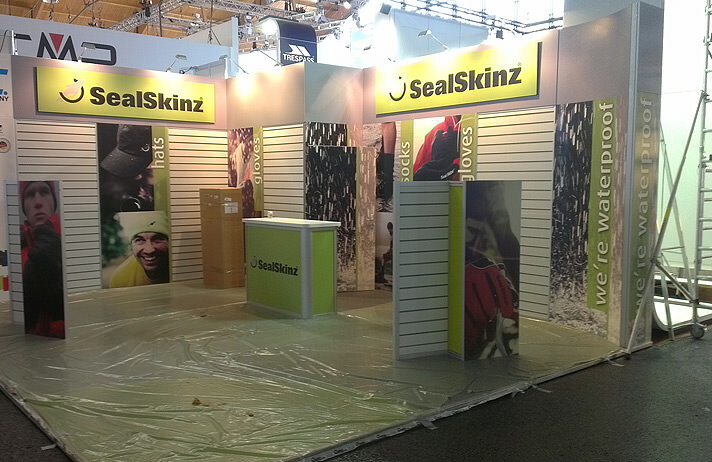 As well as the OutDoor event, we set up the Sealskinz stand at various shows across Europe and the UK throughout the year. With its modular design, the stand can be reconfigured for the various stand spaces at different venues. This design is incredibly versatile lending itself from stand spaces just 12sq meters too much larger sizes of 40sq meters. The OutDoor event runs from the 11th – 14th July and once the show is over we will be packing everything back up and driving back to the UK. Then getting ready to head back over to Freidrichshafen in August to do it all again for Eurobike which runs from 28th – 31st August. It’s definitely all go go go for us here at GGS at the moment!